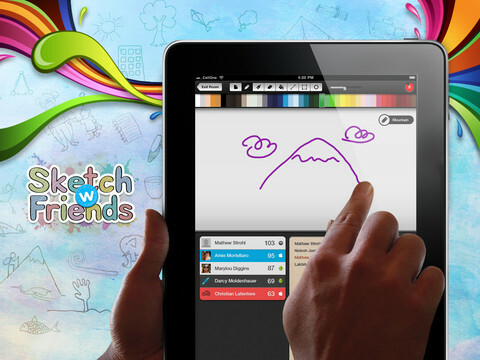 Sketch W Friends is the only cross-platform multiplayer and real-time Guess & Sketch game available across Facebook and Mobile devices like iPhone, iPad, BlackBerry PlayBook, Kindle Fire and Android Tablets. 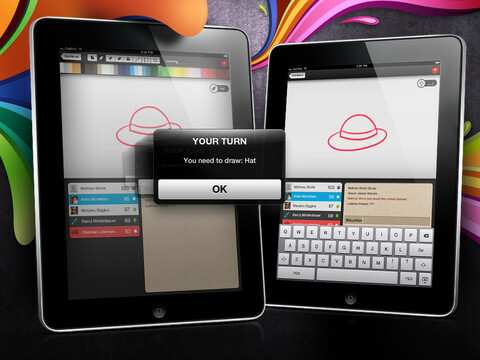 Unlike other drawing games, you don’t need to wait for people to take turns to play the game. The game play is instant and there are always players online to play. Sketch W Friends allows you to test your skills against real people all over the world instantly. Others guess while you sketch and vice versa. It becomes very entertaining and can keep you busy for hours. Sketch W Friends has been around for almost a year and has a large following. On their Facebook page, you can participate in contest, giveaways and fun activities daily. When you first launch the game you will notice that there are multiple modes to choose from including: The Salon, Platinum Lounge, Private Rooms, Artistry, and Me VS Bot. When you start up a game like Salon mode, you can choose one of the 3 given words to draw and you have a whole color palette to use as well as helpful drawing tools. When your guessing your racing against the time and other people in the room who are also guessing. Lukily they provide you with some helpful clues in case the person drawing in not that artistic. The Salon: A zone where both free and paid users can play. Platinum Lounge: A zone restricted to paid users only. There are no differences in gameplay between the Salon and the Platinum Lounge. Private Rooms: Players can create a private room and invite their Facebook friends to play. You can choose from a list of Facebook friends that already play the game and also your other Facebook friends. Me vs Bot: Keep your guessing skills sharp by practicing your guessing skills against a robot. Artistry: Draw at your own pace and share your art on Facebook and Twitter. You can either choose from the set of words given to you or pick your own word to draw. Leaderboard: Tap on the trophy icon on the left corner of the home page to view your scores. Your scores will be tracked only when you login to the game through Facebook. See the top scorers for the day, week, month and all-time. 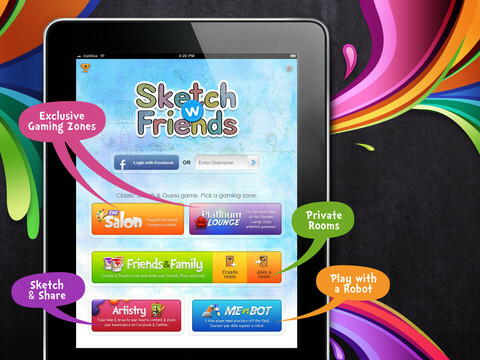 Sketch W Friends, developed by XLabz Technologies Pvt. Ltd, is FREE but also has a paid version where you have access to Private Rooms where you can just play in a closed setup with just your friends and family. The paid version of Sketch W Friends is currently on sale for 50% off priced at $1.99. The only negative I have with this application is that they have 4 apps available. A paid and FREE version for the iPhone / iPod Touch, and a Paid and FREE version for the iPad. They should consolidate these into a universal application with an in app upgrade to the paid version.